Good grief! Is Christmas really only a little over two weeks away??? I am SOOO far behind this year! 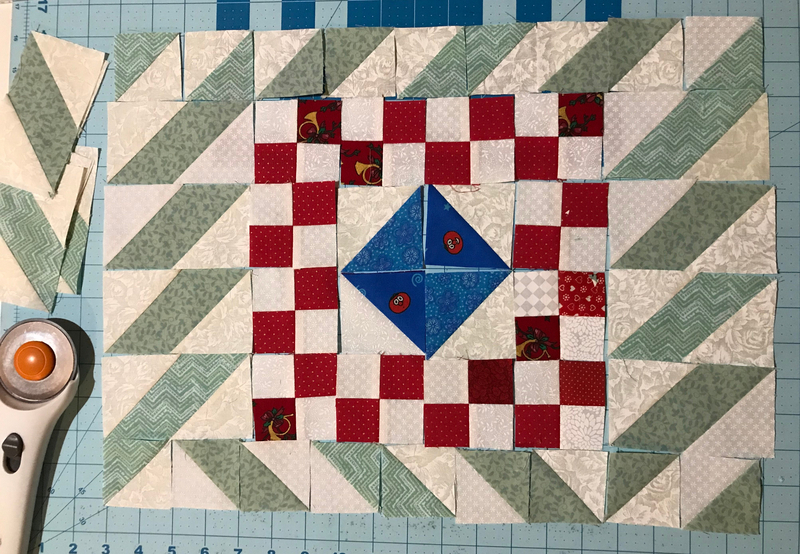 Between babysitting little ones, working on the store and the new designs to be released in early 2019, and the Mystery Quilt, I lost track of how quickly Christmas was approaching! Obviously, I need a larger basket! It is really fun to play with all of the little blocks and wonder how Bonnie is going to put them together when all is said and done. I realize the arrangement at the top of this page doesn’t work. The green and neutral squares would not fit like this after they were all sewn together, but it was fun to play with them! I only have about a fifth of the green and neutral ones sewn together at this point, but I will plug away at them in the late evenings until the next clue comes out Friday. If I don’t get all of them done, the rest will have to wait until after Christmas. In the meantime, hopefully my great-granddaughter and I will decorate the Christmas tree today. (She is hanging out with me today while her mom does nursing school clinicals), and get some online shopping and my store work done so that I can get back to “Good Fortune” without feeling guilty about taking the time to sew! Wish me “Good Fortune” as I try to get this poor naked tree dressed today!